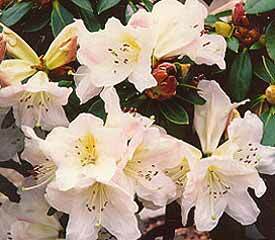 Flower/Truss Description: Funnel-shaped, white, often flushed pink, greenish, yellow or orange blotch, usually fragrant. Inflorescence 2-5 flowered. Foliage Description: Leaves narrowly elliptic to narrowly obovate, 2¾" to 4¾" long.